Considering the costs, many people view replacing a back tooth as less important than a more visible front tooth. They’re rarely seen, so who will notice? You might, eventually. A missing back tooth can set off a chain reaction of problems that can affect your overall dental health. Besides playing an important role in chewing food, back teeth also redistribute most of the chewing force away from the front teeth. Their absence can also affect the bite: adjacent teeth to the missing one will tend to migrate toward the open space, causing them to tip and rotate into an improper position. This can cause an increase in tooth mobility, excessive wear and erosion, and endanger their survival in the long run. To avoid these and other problems you should consider some form of replacement. Most dentists prefer a dental implant for its life-like appearance and durability, and because its titanium post has a natural affinity with bone. Bone cells will grow around and permanently adhere to the implant, which may stop and even reverse bone loss in some cases. Implants, though, require a certain amount of bone structure initially to anchor and position properly. If you have inadequate bone and don’t want to bone graft the area, the next best option is a fixed bridge, in which the missing tooth is replaced with an artificial crown known as a pontic. The pontic is fused between two support crowns that are permanently affixed to the natural teeth on either side of the missing tooth (also known as abutments). While fixed bridges restore function and inhibit tooth migration, they require the natural tooth supporting the bridge to be reduced to accommodate the crowns placed on them. This permanently alters them and places them at higher risk for future nerve damage, gum disease and decay. One final option is a removable partial denture (RPD). Although RPDs restore function and improve appearance, their movement within the mouth may place additional stress on the teeth that hold them in place. This movement over time could damage or loosen them. 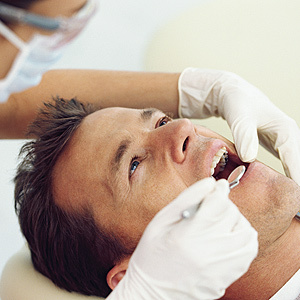 We can discuss which option is best for you after a complete dental exam. The important thing, though, is to replace the back tooth as soon as possible — doing nothing could cost you much more in the long run. Besides reduced biting and chewing function, a missing tooth can cause an embarrassing inhibition to healthy social interaction. This can be especially so for teens who greatly value peer relationships and acceptance. Be that as it may, we typically discourage a permanent replacement for teens with a missing tooth, particularly dental implants. While we value a patient’s psychological needs, the long-term effect on dental health may be too great to advise otherwise. The effect we’re concerned with involves jaw growth and development. Although a person’s permanent teeth have usually all erupted by early adolescence, the jaws continue to grow until the late teens or early twenties. Natural teeth can adapt to this growth because the periodontal ligament that holds them in place allows for incremental tooth movement. The teeth move in response to jaw growth and are thus able to maintain their proper relationship and alignment in the jaw as growth occurs. Dental implants, on the other hand, are imbedded into the jaw bone: they, therefore, can’t move like natural teeth and thus can’t adjust their position with jaw growth, particularly the upper jaw as it grows forward and down. This can result in the implants appearing as though they are left behind or retreat into the jaw. It can also affect the position of the gums and inhibit their growth around the implants. It’s best then to hold off implants and other permanent restorations until the jaw has finished developing. That, however, isn’t always easy to determine: specialized x-ray diagnostics may help, but it’s not an exact science. Your input as a parent will also be helpful, such as whether you’ve noticed the end of growth spurts (not changing clothes or shoe sizes as often) or your child’s recent similarity in appearance to other adult members of your family. It thus becomes a judgment call, based on examination and experience, as to whether it’s safe to proceed with implants — and may require erring on the side of caution. In the meantime, there are temporary restorations that can improve appearance while you wait for the appropriate time to undertake a permanent restoration. Two of the most useful are removable partial dentures (RPDs) or a bonded bridge, a less invasive form of the traditional bridge. With a proper assessment we can advise you on which option is your best choice.